Tru here. 2014 was the year I realized that, in an ideal world, the collective lived experience of Persons With Dementia (PWD) would be a rich resource for dementia professionals (or any person) dealing with PWD. 2014 is the year I began hallucinations, and then began Aricept prescription. Aricept much improved my hallucinations, recognition of husband, and reading comprehension for over six months. After this increase my reading levels continued to drop and I have not increased my Aricept dosage. By the end of 2014 my reading comprehension dropped back down to sixth grade, and then further dropped to fourth-grade level. Awkward situation now, but I can write better than I can read, so I lost much ability to edit what I write. During 2013, I spent many hours looking for PWD blogs. I found a few, but most were inactive. Left some messages but no one ever responded. During Springtime 2014 I started realizing what a rich resource this information is. For fellow patient, caregiver, or professional, narratives from “lived experiences” of collective PWD should better prepare anyone interacting with individual PWD. Astute caregivers and medical professionals will recognize benefits from descriptions of Lewy Body hallucinations, vividly dramatic dreams, pinball-effect of sound and light, characters and creatures produced from coloring and texture of coverings for walls floors and windows, and other daily events. Wise persons can APPLY these “lived experiences” in their daily interactions with persons who are no longer able to easily communicate. Frustration: I became part of several groups for mixture of patient and “caregiver”, but they held comparatively few patients. I learned why. Often mixed groups appear to be a safe venue for venting “caregiver” frustration, but little APPLICATION of lived experiences from other patients takes place. The dementia patient experiences little peer support, and is not really able to impact care of other patients, multiplying their frustration. I dropped my membership in those groups. Frustration: Stigma-induced attitudes and terminology triggered my comments at newspapers, magazines and webpages, but were often never approved, adding to my frustration. However, it is a good thing I did this reading and commenting while I could, since my reading comprehension further dropped during 2014, largely preventing my understanding of most news articles now. To top it all off, it felt like I was the only person on earth (PWD or non) who was interested. Frustration: The PWD text group did not want to hear about my advocate efforts. Not only were they not interested, but they were offended by “self-promotion” if people linked a personal blog or current project. I was part of an organized video “support group”, but they were not interested either. During weekly update round-robin for that support group, it was clear that even two sentences of my current advocate efforts were two sentences more than enough. I can’t complain. It is just that no one else was truly interested; it was not important to them. I don’t want people to pretend interest just to be nice! Since I couldn’t really talk about my current activities I re-directed my efforts to projects. 1. Blog: Began my blog http://www.truthfulkindness.com on July 12. I paid for a year’s use of blog webspace at that address. This blog has a rather specialized interest audience. It has been over ten years since I became disabled so I had no friendship base from which to pull readers. Consequently blog readership is still comparatively low with ~240 viewers per week. However, my personal perspective is that who knows what wise decisions will come from those particular readers, in part from factor of what they read in my blog? The number of readers is not crucial, but those decisions and alteration of attitude may be. I feel very good about productivity from my blog. 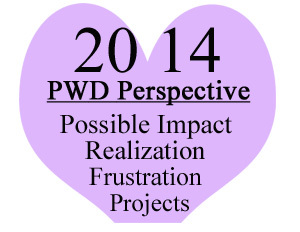 It wasn’t until summer that I began gathering blogs of other PWD into weekly newsletter titled “PWD Perspective”. I paid the fee for one year in order to enable ability to work in draft format and web-publish in an ad-free environment. The first few months were very encouraging, with readership between 50 to 80 per week. But I could not continue that huge investment of time and effort. As long as I sent individual Twitter links for newsletter to each recipient who showed interest, each week, I continued to get responses of how helpful the blogs were, etc. But they did not subscribe, so when I quit sending individual links for each newsletter, readership dropped to 10% of that number! Considering the hours in prep-time each week, why continue herculean efforts shouting to only wind and trees? Modification was clearly needed. Different preparation techniques are now planned for 2015 requiring much fewer hours, and frequency will be monthly instead of weekly. 3. FaceBook: Since so many of my friends are active on Facebook, but do not blog, I also began gathering FaceBook updates for my friends into “PWD Perspective”, but FaceBook recently deleted that account. FaceBook offered to transfer information into either “page” or “group” status, but neither of those formats worked for this purpose. FaceBook project seemed to have a nice response during the months that it was operational, so this was quite a disappointment. 4. Public Speaking: Submitted abstract for oral presentation at 2015 ADI Perth conference. We will see what happens with that project, but the possibility is exciting. 5. Memoirs: Still have not given up on the idea of someday publishing my memoirs, but have not worked on them much this year. I have not had time, with my advocate efforts as priority. 6. Personal: Now have craft room available, but no time to devote to my craft projects … yet. This entry was posted in Journal and tagged alzheimers, caregiver, lived experience, patient, Persons With Dementia. Bookmark the permalink. Thanks George! 😀 Your opinion matters hugely to me! For myself, it is not a lack of interest, but more the inability to follow up. Such as you spoke of your decline in ability to edit what you have so beautifully written, it is my decline to follow what I read or contribute. I believe all your hard work is vital to any that read it, so please carry on as best you can. In my opinion…perfectly! I have been sitting trying to put into words what finding your blog has meant to me – but struggling for the right words is one of my big frustrations! 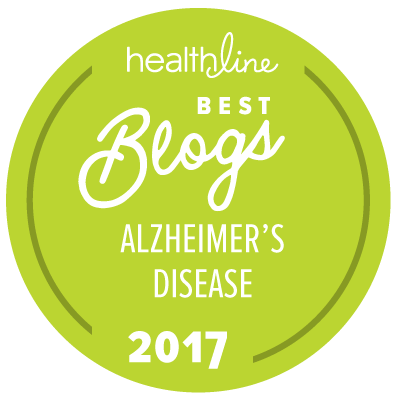 With still undiagnosed dementia of some sort it is hard to find anything online that really reflects my feelings but your blog does. I now go sporadically which is a shame. but fortunately I am usually ok with my own company! Thank you so very much, Sara! Looking forward to getting to know you. Did you see the page with blogs from others? It is https://truthfulkindness.com/about/links/ . — Tru.